Day number two. Here’s a friend of mine who has recently followed the light at the end of the Steam-powered tunnel. 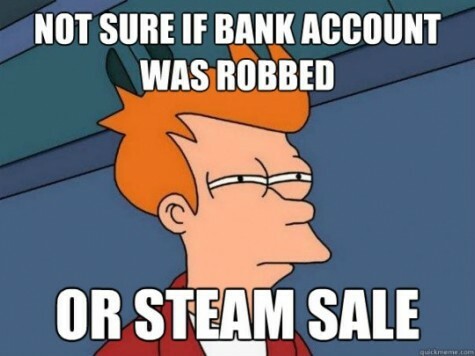 Steam and sales – two words that are burnt into the minds of the lucky people who are part of the glorious PC Master Race, (sorry console kids). The sales are those of legend, creating hysteria, hype and pandemonium, ravaging our wallets of the hard earned cash that we have so long worked for. But Steam hasn’t always been the go-to marketplace for PC. Believe it or not there once was a time where people were highly critical of the platform. Most people of the Glorious PC Master Race would agree hands down that Steam has had an enormous impact on the revival of gamers returning to the PC, yet as I stated earlier, there once was a time where people despised and hated Steam! Many saw Steam’s vision as a possible fall for the PC. It was 2003 when Steam hit the market and on its release it was met with great skepticism. The idea of downloading a program to launch a game seemed crazy, especially with many claiming to experience performance hits with Steam running in the background. It was a downright poor experience for anyone looking to play a Valve game in 2003, but it was the only way. Especially at a time when the norm was only to install and play. What added to the apparent hate was that Steam was incredibly unstable. Constant crashes, hanging, lag and have other technical problems, and if a program didn’t want to run, then sorry boy no game for you! Not being about to play a Valve game because some random program wasn’t working was almost the beginning of the end. This was DRM (“Digital Rights Management”) at its worst. This was Steam. From this apparent initial failure, how could Steam ever make a serious mark in the PC world? All can be summed up in one word… SALES! Yes, sales, for after many years of tweaking, updating, and signing deals with many major game developers. Steam and its “Lord Gaben” (Valve managing director Gabe Newell) were able to bring us the sales that we have come to love! How can you not love 50%, 60%, 75%, up to 95% off a game’s full price! But price cuts are only one part of the magic of the Steam sale. Those who have participated in the sales recently would have come to realise that it’s much more then a sale, its a game! Madness, I hear you say? Hear me out. In the past couple of years, Steam and its Lord Gaben have devised a scheme called “Steam trading cards” wherein you receive a card for every $10 you spend during the sale. Once you have collected all the available cards, you can craft you cards into a badge. What does this badge do? Well, grants you prestige among you fellow Steam friends and experience points for your profile level (you heard me, levels)! What was once buying games because you wanted to play them has now turned into, “I probably won’t ever play it, but it’s too damn cheap to pass up and plus it will work towards my ability to scroll through my games! (Ah yes, the pleasure of scrolling through your list of games – brings a tear to the eye) What was once hate has now turned to love, and this new love of Steam has turned itself into a form of cult on the internet, praising Steam and it’s Lord Gaben. Now Steam isn’t the only form of online game purchasing, and not always the cheapest, even in sales. But from its despised beginning, its has become the one place that people have almost universally come to love. On that note my dear friends, I shall see you all at the next winter/summer sale and thus have our wallets plundered! Damn you Gaben! I shall also leave you with this fan-made site to give you inspiration for the next sale.